HISA is thrilled to have Professor Enrico Coiera presenting via webinar “A new informatics geography” on Tuesday 17 May at 1:00pm. His presentation will recap his acceptance speech given at MEDINFO 2015 in Brazil, where he was awarded the Francois Gremy Award of Excellence by the International Medical Informatics Association (IMIA) – the highest award in this discipline internationally. The webinar will explore the fundamental purpose of automation and its relationship to humans. Professor Coiera notes the frustrations people have with real world information systems, particularly the process of implementation. “Unanticipated challenges arise frequently, and unanticipated consequences can follow,” he says. “Yet the fundamental purpose of automation is to make us better at completing tasks than if we were unaided. He says health informaticians in particular, should ask specific questions about focussing solutions on technological means, humans, or a partnership between the two. 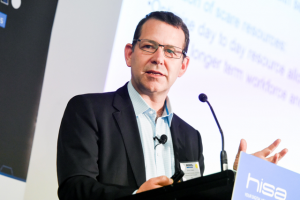 Professor Coiera is a long-standing HISA member, Director of the Centre for Health Informatics, Professor of Medical Informatics at Macquarie University, and Director of the NHMRC Centre for Research Excellence in E-Health. He has been an active researcher in health informatics for over three decades.